How to Root an Android device without a computer? Android is the smartest and perfect application OS in the world as per the recent trend. Cool gadgets deal with the Android OS for good workability. The android users recently seem to be the rocking users in the smartphone world. The Android device comes with the agreement that restricts the users to access the system file normally. The restrictions can be easily lifted by just “ROOTING” your Android device. The Rooting process is the process which will make your device fly over among the other normal Android users. Rooting is the method of granting the Android device to access the confidential system file without any issue. The process of allowing the user to do some tweaks and modification. It will sure do advanced technical customization in your device. There exist more fun and tweaks in the Rooting of any Android device involves. The rooting of any Android device may result in exceeding the Terms and Policy that are already predefined by the OS vendor. So rooting may harm the whole device in many hidden ways if it is not handled properly. The pros and cons are briefly explained in the below section. Speed the device through various applications that are only accessible to the advanced rooted Android user. Good battery backup is maintained throughout the lifetime using the user-friendly application by the one-click method. Patching of any applications or games can be practiced and also the pirated application can be easily used without any issue. Full protection can be done by simply installing mobile tracking application into your device so that the thief will be caught even if he/she resets your Rooted Android device. Everything can be made automatic and things can be easily achieved by many automation applications. Thus saves the user time to sleep for an extended time. Increase the Phone memory and expand the internal storage capacity by partitioning the SD memory card (Link2SD can manage the whole partition process). The whole device looks smarter and faster by flashing the Custom ROM into the Rooted device. The appearance can be personally tweaked using the advanced customization process. The system application data can be safely backup/restore using certain applications. The best-rooted applications and most needed tweaks will be discussed in the next blog post. Void the warranty provided by the vendor. It may harm your ROM and stored data. The booting loop problem may occur if wrong ROM or modules get into your device. Malware and virus attack may damage your Android device. It is totally unsafe for the users who have confidential data in their smart device. No official update would be provided by the vendor. Slaggy performance and unstable of the applications may arise. The rooting of the application is normally done for using the rare and useful applications that require advanced technical knowledge to use. The rooting process is traditionally done via a PC or LAP. But don’t worry, there is the other chance to do the same process via the victim Android device easily. There are huge collections of applications and techniques involves in the rooting of Android without a PC/LAP. 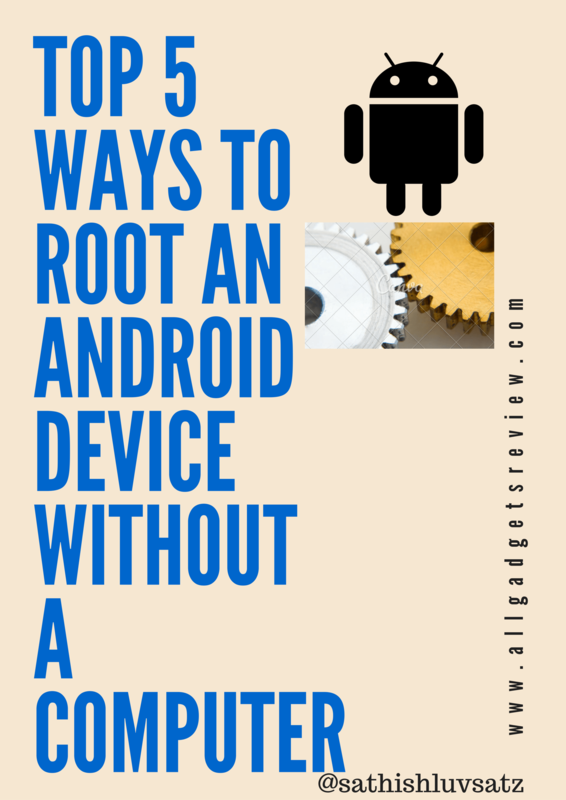 But AllGadgetsReview exclusively provides you the best and easy Top 5 method of “How to Root an Android device without a computer” in this tutorial. Top 5 ways to root an android device without a computer. The Top 5 Rooting of an Android Device without PC. Check whether your device has root access via the simple application called “Root Checker“. There are 3 major preliminary precautions steps are to be noticed and handled safely before diving into the advanced Rooting process. Backup all your sensitive data safely as it will not hurt you if something went wrong. Make sure your device is healthy and you have at least 50% of battery charge. Allow the USB Debugging settings from your developer option in your phone settings. This application is exclusively ranked 1 by the review team of AllGadgetsReview. As this application is widely used for rooting the device spontaneously. It is a little and effective application that patch the system file. Usually, the Jelly Bean version shows the best rooting result. First download the Framaroot application into your smartphone. Now click the “Install Superuser” option from the screen. Click on any one of the Exploit mode and wait for 2 minutes. Now your device will be rebooted twice (restarted twice). Finally, the binaries get updated once the root process gets completed. Note: If rooting doesn’t work by the above exploit, simply try the other exploits to obtain a good success rate. It was established by the team of GeoHot group earlier to easily exploit the Android OS without the usage of computer or PC. The Samsung devices show the best result. Download the Towelroot application straight into your device. Open the application and look for the “Make it ra1n” option. Click the “Make it ra1n” option and wait for at least 25 seconds of time. Your device will be rebooted and you can check the success message via the “Root Checker” application. It is the trending application to root the Android very fastly and safely. It gives good scoring and better UI for the user. Install the downloaded Kingroot application. Open the app and click the big green button stating as “Root your device”. Wait until your devices get restarted and verify the root status. This pretty application will follow the same procedure as explained above. So install the Universal Androot application and root your device in an awesome way. Also check – How to change Android ID in Rooted and Non-Rooted device? It is the best Chinese made exploiting application and it can make a fruitful way for Rooting the device. Make a backup of your data, as you can regain any lose data. Install the updated version of iRoot or vRoot first. Open it and agree to their terms and policy. Then click the Green color huge button. Wait for few minutes and look at your device for any new application called “King User”. You will get a notification as “Device Rooted”. Also, check via Root Checker application for the exact status of your Android device. Thus, the 5 Top “How to Root an Android device without a computer” has been successfully compiled and shown by the AllGadgetsReview. This article should be taken as an educational source and the author is no more responsible for any action that occurs during the above process. But you can ping us under the comment area below if any help or issue happens during the Rooting process. Tx bro but some links r not working..